The new G33 magnifier is shorter and lighter than the G23. It offers a new and improved mount providing faster transitioning from 3x to 1x, tool free azimuth adjustment, larger field of view and an adjustable diopter for improved, more precise focusing. This new G33 is an affordable magnified solution that will transition a fielded HWS into a lethal medium range optic. Superior light transmission and a large field of view helps this magnifier put the competition to shame. This rugged, streamlined optic offers split-second transitioning from CQB to medium range targeting.This is the 3rd Generation of L3 EOTech magnifiers. It offers more eye relief with windage and elevation adjustments that can be manipulated by hand, without any tools. The new slap to side mount is incredibly durable and operates with the slap of your hand, knocking the mount to the side. The G33 also offers a locking, quick detach lever for easy attachment and removal of both the optic and the mount. This magnifier aligns perfectly with standard height sights and comes with a 7mm riser to accommodate the 7mm raised sights. 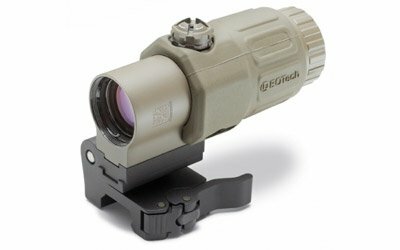 G33 with new Quick Switch to Side (STS) mount is faster than ever, just push the magnifier to the side and it will lock securely in that position until you push it back into place for magnified viewing. If you have any questions about this product by EOTech, contact us by completing and submitting the form below. If you are looking for a specif part number, please include it with your message.